Apple has been one of my absolute favorite stock for over ten-year now, and the company has right now become the first U.S company to close with a market cap of more than $700 billion. Market cap today is 720,14 billion. Apple is now twice as valuable as Microsoft ($349,6 billion), and has nearly doubled the market cap to the previous worlds biggest company Exxon Mobile ($379,01 billion). 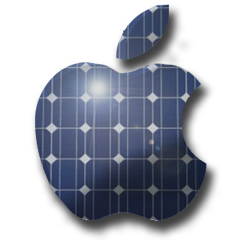 Exxon is not a green company, but Apple is and that`s where the future is. All of Apple`s data centers are now powered by renewables. Wind power has long been cheaper than solar, but solar power is the future. According to IEA (International Energy Agency), solar will become the biggest single source of electricity by 2050. The price of solar has been declining much faster than wind, and once the solar is cheap enough it will become mainstream. Some investors have a 12-month average target price of $132,56 and the highest target was $165. If Apple continue to rise in market value it would exceed $960 billion. Investor Carl Ichan said the stock price for Apple is cheap and expect it to grow further. The stock is now trading at $123,89, up 1,54%. Apple is the most popular luxury brand in China, and what do you think will happen when the brand goes mainstream? First Solar is trading at $48,89, up 0,70%. Many investors have a hold on that stock now. Revenues fell 29,7% and that`s faster than the average of 9,8%. That hurt the bottom line and decreasing earnings per share. Cash flow is also down by 112,5% and debt-to-equity is 0,05 which is also lower than the average. It doesn`t look good right now for First solar. Their return on equity is also below its industry average. it`s below S&P 500 too. The stock was gaining in after-hours trading yesterday and increased nearly 2% on heavy volume after Apple`s solar power announcement. Price earnings is 18,43. EPS: 2,66. This makes First Solar as a clear industry leader in cadmium telluride PV technology.